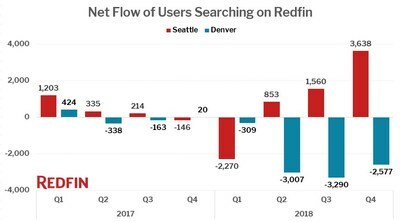 SEATTLE, Jan. 30, 2019 /PRNewswire/ -- (NASDAQ: RDFN) — Twenty-five percent of home searchers looked to move to another metro area in the fourth quarter of 2018, up from 23 percent the year before, according to a new report from Redfin (www.redfin.com), the next-generation real estate brokerage. The national share of home searchers looking to relocate has been steadily increasing since Redfin began reporting on migration in early 2017 and currently sits at its highest level on record. To read the full report, complete with additional data, interactive migration maps and methodology, please visit: https://www.redfin.com/blog/2019/01/q4-redfin-migration-report-seattle-reclaims-migration-destination-status.html. Redfin (www.redfin.com) is the next-generation real estate brokerage, combining its own full-service agents with modern technology to redefine real estate in the consumer's favor. Founded by software engineers, Redfin has the country's #1 brokerage website and offers a host of online tools to consumers, including the Redfin Estimate, the automated home-value estimate with the industry's lowest published error rate for listed homes. Homebuyers and sellers enjoy a full-service, technology-powered experience from Redfin real estate agents, while saving thousands in commissions. Redfin serves more than 85 major metro areas across the U.S. The company has closed more than $60 billion in home sales. For more information or to contact a local Redfin real estate agent, visit www.redfin.com. To learn about housing market trends and download data, visit the Redfin Data Center. To be added to Redfin's press release distribution list, subscribe here. To view Redfin's press center, click here.